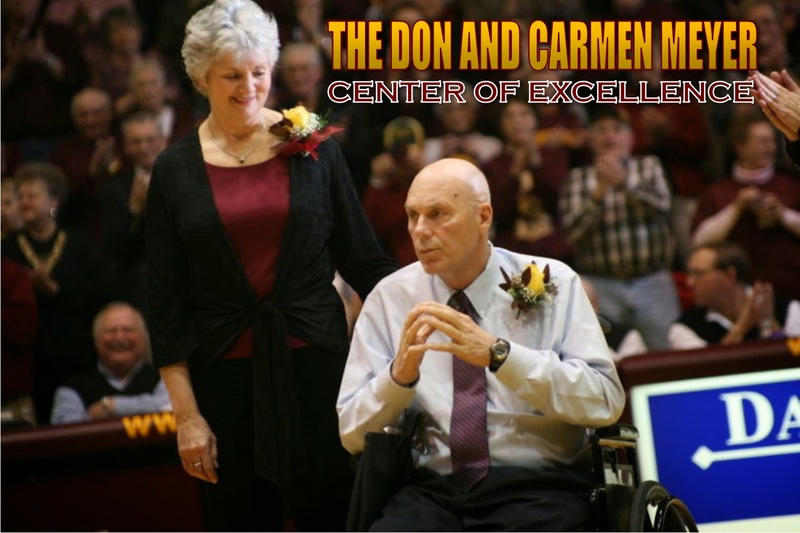 A cancer center in South Dakota will bear the names of Coach Don Meyer and his wife Carmen, providing an enduring legacy for the legendary basketball coach and his primary caregiver. The Don and Carmen Meyer Center of Excellence will house the new Avera Cancer Institute at Avera St. Luke's Hospital in Aberdeen. For those that were close to Coach Meyer, they know that the last few years of his life was dedicated to raising funds for the Center of Excellence as well as awareness for the mission of the facility. And as only Coach can, he is continuing to pay it forward even after his passing. Carmen is continuing the goal of completing the facility and I am asking all of those who Coach Meyer has touched to please make a donation -- no matter how small. The ground breaking for the center is going to be October 7. You can make a tax deductible donation in memory of Coach Meyer and it would be a tremendous way to honor him. You can make a donation online or via mail by click this link. Donation directions are on the right. The fight against cancer goes on, and there is no one we know who can say they have not been touched by this terrible illness. Whether it is a family member, a close friend or you, we are all affected differently, but the common thread that connects us is life altering. Though this journey hasn’t been easy, we feel so fortunate to have the Avera Cancer Care Center right here in Aberdeen. Being able to get treatment close to home, family and friends has been an enormous blessing for us. Dr. Richard Conklin and his team are true professionals, and we know that we could not have received better care anywhere else. Unfortunately, the need for the Avera Cancer Care Center continues to grow exponentially each year. There is not a day when the waiting, treatment and exam rooms are not overflowing with patients. Your support can help our community step up the fight against cancer. Please join us in supporting this campaign to construct the new Avera Cancer Institute of Aberdeen. We are confident that this initiative will build on the success and greatly improve the availability of services. We hope you will consider helping us. 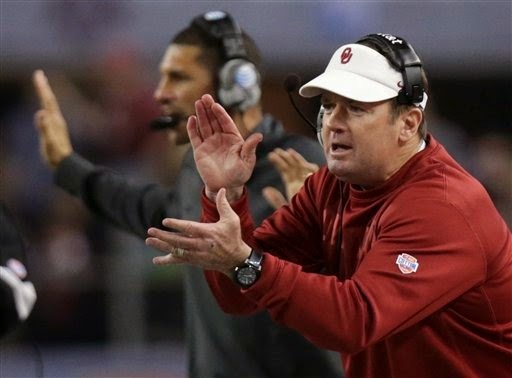 This is part 3 or 3 parts of notes I took listening to Bob Stoops, the head football coach at the University of Oklahoma at a clinic following his 2001 National Championship team. We want to take away offensive strengths by player percentages. I heard Bobby Bowden talking several years ago when I was coaching at Kansas State. Coach Bowden said, "if you try to take away everything the offense does, you end up taking away nothing." If you try to stop everything, you end up stopping nothing. Everyone has some true offensive players that they love to run. You have to take away what they like to do. Take away their best plays, and then re-act to the trick plays as best as you can prepare with good fundamentals. The players need to know that they have to stop. You cannot give them 15 plays to stop. Give them the most important. Be great in critical situations. This includes third down, the red zone, and goal line (basketball special situations). Our offense seems to be extremely complicated, but it isn’t. It is fairly simple what we do. We are going to force the opponent to defend the entire field (spacing). We want to force the defense to defend the entire field. We have had as many as 12 to 14 players catch passes in a game...We do not want the defense to be able to zero in on us and say that this is the one guy we have to stop. We want to get the ball in the hands of several players, and we want to give them a chance to make a play when they get the ball. We take advantage of what the defense gives us. We want to be able to audible to any play in our system. We want to use the run game to complement the pass. A big part of our success this year was the consistency of our running game. We want to keep the defensive front seven on the run. We want to keep them out of their comfort zone. 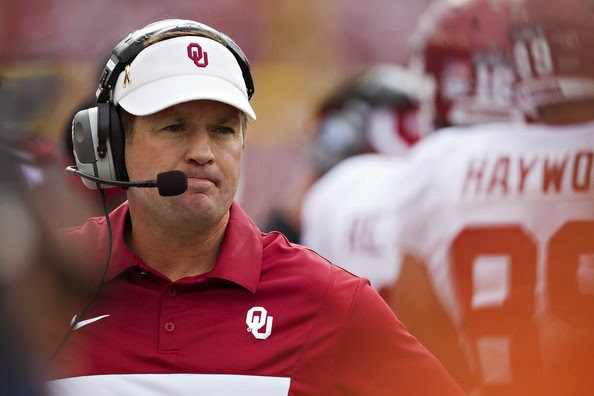 This is part 2 or 3 parts of notes I took listening to Bob Stoops, the head football coach at the University of Oklahoma at a clinic following his 2001 National Championship team. The things we developed this year as opposed to that first year was this. We developed the work habits and the discipline to finish off the games when we were ahead in the games. We were a better football team, and we were better prepared. We were in better condition. We were stronger than we were a year ago after another year of training. We were more disciplined in our regiment and in our fundamentals to finish off those games. We were a tougher team, so we could finish off those games when we were ahead. We were able to build leads that were larger than they were the year before. It was not enough to talk about it. We had to develop work habits, the discipline, and the toughness to earn that right to have those expectations. That has been engrained into our players. They know they have to earn the right to have the expectations. You earn it by the way you work, the way you prepare mentally, and the way you prepare your body physically. You had to have a toughness about you to be able to succeed. Players have to trust and believe in one and another. You have to find dif-ferent ways to get the players close. When I first went to Oklahoma, if we had eight players in the dinning hall, we would have them sitting at seven different tables. Now, you walk in our training table you will see eight play-ers at a table that only seats six people. You have to find ways to get the players to care about one and another. You must give a good effort. To me the best compliment you can receive is when someone tells you, "Coach, it is fun to watch your team because of hard they play." I value that comment more than any other. We grade effort. We want the tape of the game. After we critique the film for assignment and fundamentals, we will go back and go through it quickly to see who is player fast and who is player not playing fast. We look to see who is player hard and who is not playing hard. Create team unity and establish trust. The players are going to follow the lead of the head coach. We want to let players hear the terms over and over. Make sure players have fun while they work. Talk confidently and positive-ly to players. Eventually they will believe you. You want the guy that isn’t so good to think he is great. As hard as it is at the time, we will never accept a losing performance. I will not tell a kid that his effort is not good enough. I will tell him here is how you should do it. Even if the player can’t do it, I will tell him how it should be done. Never tell a kid that he is lousy, or that he can’t do some-thing. Eventually he will believe you. Teach them in a manner where they will accept it and try to change. We are going to play players that play hard and make the most plays. Don’t play potential; play players. If we play harder, smarter, and more aggressively than our opponent, we will win. It takes no talent to play smart, to play hard, and to be aggressive and to be tough. Coaches must have great respect with one another and a great working relationships. Keep egos out of the office. 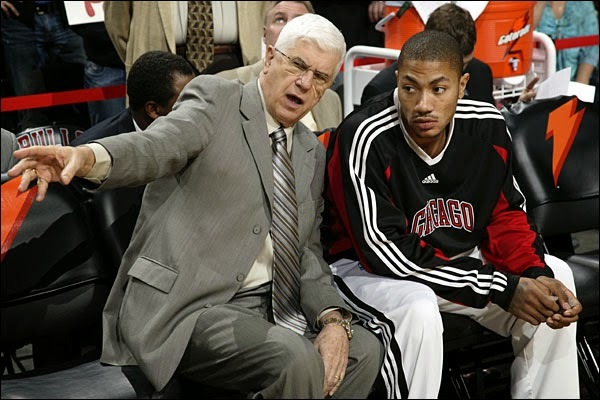 Coaches must be willing to help each other, and they must be willing to help others coaches on the other side of the ball. As coaches, we always take the blame for our players. "It is my fault." I am not talking about the media. I am talking about in the meeting room and one-on-one. If I could give them a couple pieces of advice, I would start with this: ‘Don’t ever go to a meeting to watch a practice or a game without having already watched it by yourself.’ That’s one thing that I have always done. When the coach is controlling the remote control, he’s gonna rewind when he wants to rewind. He’s gonna skip certain plays. He’s not watching every single detail. When you can control the rewind button, you can go in there and you watch—first, you better watch your mechanics. Watch what you’re doing. Is your drop good? How’s your throw? OK, now rewind it again. Now you better watch your receivers. OK, looks like Demaryius Thomas ran a good route here. Not sure what Julius Thomas was doing here. Then you better rewind it again and watch what the defense is doing. So, there’s time in that deal. You have to know what they were doing so you can help them. So that has helped me. When I go in and watch it with the coach, I’m watching it for the third, fourth, fifth time. That’s when you start learning. Coach Del Harris speaks of five levels of communication with players—use each one less than the one before it as you go down the levels. 1. Conversational level: You have the give and take whereby you get to know the player and he learns you as well. You demonstrate you care. Use this the most. 2. Encouragement level: Voice is animated and enthusiastic. Use it as much as you can, but it has to be a result of real achievement, not just blowing smoke. But the worst person to be with is the one you simply cannot please. Be real. 3. Instructional level: Voice is slightly animated as you attempt to pass on teaching points that may help your player get better, or that may help him understand the team concept. Use often, but mostly in practice or in certain 1-1 situations. 4. Correctional level: Voice increases somewhat in urgency, but this is not to be confused with screaming. Naturally, this is used on important issues in practices and games to help eliminate errors. Use it as needed, but if it overwhelms the encouragement level, the team will tune you out sooner than later. 5. “Go Nuts” level: Yes, there is a place for letting them know that they have crossed the line in terms of lack of effort or execution or attitude, etc. They must know you really care about certain issues. But, of course you must maintain control here, as it should be a purposeful act. Overdo this level and you will lose your team by Christmas unless you are winning every game. 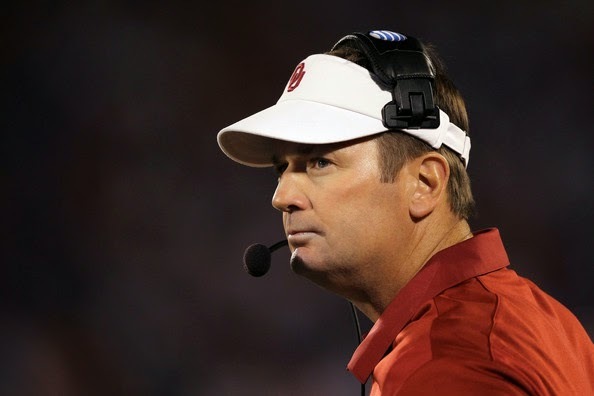 This is part 1 or 3 parts of notes I took listening to Bob Stoops, the head football coach at the University of Oklahoma at a clinic following his 2001 National Championship team. I believe the more you expect, the more you will get. If you expect an un-defeated season, and you only win 10 of 11 games, it sure beats the heck out of being 5 and 6. Expect a lot, and you have a better opportunity to get it. We walked in to Oklahoma and raised the expectations. I believe in being positive, and I believe in being confident. I believe the more you talk to your players that way, the more it becomes a part of their nature. A confident and positive player on the field is better than one that isn’t. When we started our first winter workouts, we had 20 players that had to fall out of the drills the first day. They could not make it through the first workout. They were throwing in the trashcans, pulling up with pulled mus-cles, and all kind of excuses. They were in bad shape. Probably, the best person I hired was our strength and conditioning coach, Jerry Schmidt. ...what I getting around to is the fact that everyone talks about changing their perceptions and raising their expectations. Everyone does that. What we talk a lot about is "earning the right to win." We talk about earn-ing the right to those expectations. You can expect to go 13-0. You can say that. But, you have to earn the right to put that expectation up on the board. We run a winter program at 6:15 am for three days a week. On one of those days three days we do speed work, and the other two days we do agilities. The way we work out is something to see. We really go hard. I am not one to go get one of my coaches up at 5 am in the morning to get that one player that is late to the workout and have him work extra. That is hard on the assistant coaches. I do not want to do that. Why should I make one of my assistant coaches get up early? If the player does not have enough responsibility to get to practice, then we are not going to play that person. They have to be accountable and responsible to their team. We had excellent participation in our summer workouts. We had 85 to 90 percent of the players there for the entire summer. In the second part of the summer, we had 95 percent of the players working out at school. We had great participation, and it make a difference. We were making pro-gress, and we were committed to winning. We had great participation, and we were acting like a team. You will never hear me tell the players that we should have won a game. You will never hear me quoted as saying, "we should have won." I do not believe in it. You either do or you don’t. It is as simple as that. The big quote association with me is "no excuses!" To be frank, I have never heard a good excuse. They all amount to the same thing. They all amount to losing. Those who are faithful reader's of this blog know how we feel about the importance of process over results. Far too many get caught up in setting destination goals as opposed to living daily striving for excellence in all they do. Life is about mastery and mastery is a daily process -- sometimes involving the most mundane activities. 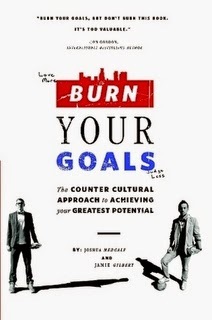 Yesterday, spending time in airports and airplanes, I read "Burn Your Goals" by Joshua Medcalf and Jamie Gilbert. It is one of the best books I've read in regard to understanding and living the process. I believe it is a necessary read for coaches and athletes and I will blog a little over the next week about a few of the passages. One chapter, "The Resources Myth" hit home because of my own coaching journey of some of my stops along the way. 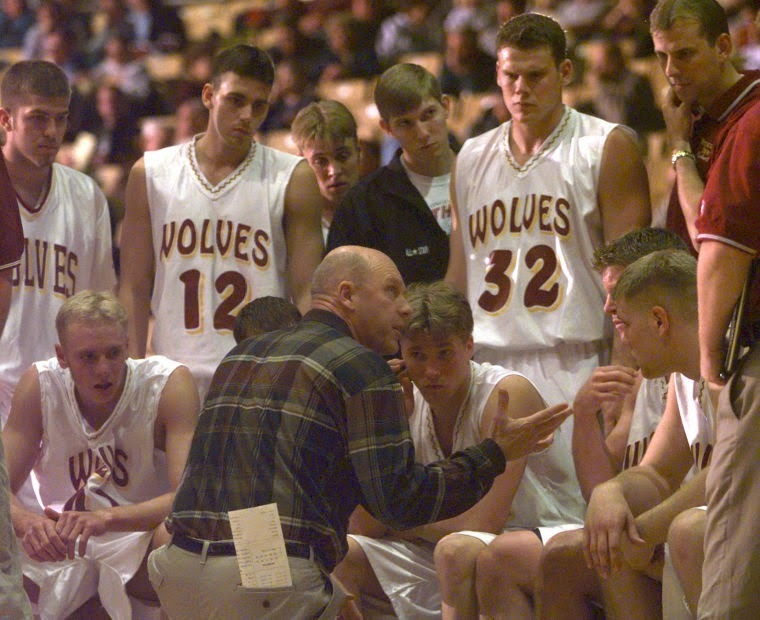 It also brought back fond memories of Coach Don Meyer and all that he accomplished in his career. If we were to hear Coach Meyer speak this fall, one of his topics was always doing the best with what you have with where you're at. And he would no doubt encourage us all to read "Make The Big-Time Where You Are" by Frosty Westering. The thing to know about resources is you have what you have and you don't have what you don't have. 1. They get the most out of what they do have. 2. They utilize their imagination to overcome what they don't have. The "lack-of-resources" myth not only cripples creating thinking but it also has another harmful effect. If limits the people you will attract. Successful people's ears perk up when they see and hear about people being resourceful and persevering. What is the smallest version of my dream I can start right now, using what I have, right where I am at? What is one thing I can do make this better? Those who are faithful with little will be trusted with so much more. I believe a lot of people would be fascinated to sit in on our staff meetings here at Texas A&M. The novice probably believes that we spend a great deal of time talking about X & O's -- and nothing could be further from the truth. The subject of basketball itself is towards the bottom of the list. Our #1 subject? Our student-athletes -- their academics, their health, their attitudes. Programs of excellence don't deal in things, they deal in people. There is not a day that goes by that we don't meet as a staff or in pairs to talk about our student-athletes and their needs. Subject #2 is most often recruiting. Why? Because it deals with us bringing in new family members. Again, many would think we would talk entirely about skills but we spend a great deal of time talking about attitude, personality, and the other intangibles. Subject #3 is about what we are doing to develop our team chemistry. What are we doing as a team so we can continue to learn and grow together. Yesterday in our staff meeting, this was a major subject. We looked at our team calendar and discussed ways and dates of building our community. I once read the statement, "Even when you're played the game of your life, it's the feeling of teamwork that you'll remember. You'll forget the plays, the shots, and the scores, but you'll never forget your teammates." That is describing the community that develops among teammates who spend time doing things together. The only to develop community and cohesiveness among your teammates is to get them together, not just in a professional setting but in personal ones as well. 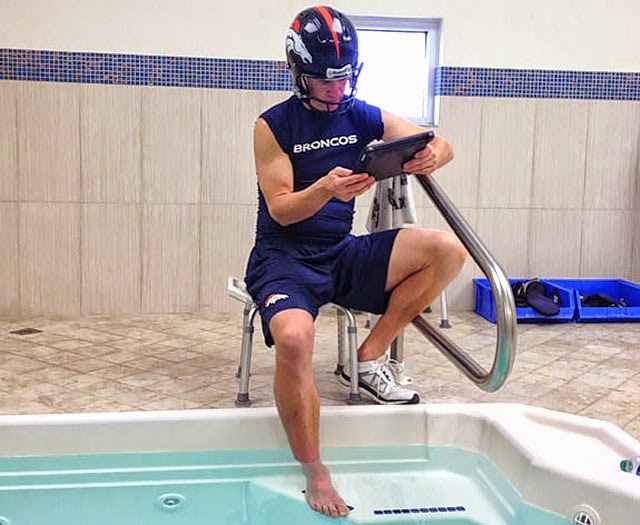 There are lots of ways to get yourself connected with your teammates, and to connect them with on another...the where and when are not as important as the fact that team members share common experiences. As we inch closed to the 3rd Annual Gary Blair Coaching Academy, I want to occasionally list a few of the reasons that make us proud to be the host. First and foremost, Coach Blair has a great passion for growing our sport. Not all programs open their doors and share anything and everything with coaches off all levels. My presentation at the Academy is titled "Don Meyer: Lessons Learned and a Legacy Left." I will speak about the many lessons I learned from Coach Meyer over the years, on the court and off as well as share some of my personal stories about coach. The presentation will include photos, video and as much of Coach Meyer's basketball philosophy as I can fit in during the allotted time. I've spend a great deal of time working out the details and I believe those that know and follow Coach Meyer will enjoy this presentation. Interested coaches may register here or get additional registration details here. Those attending the Academy will receive two DVD's. 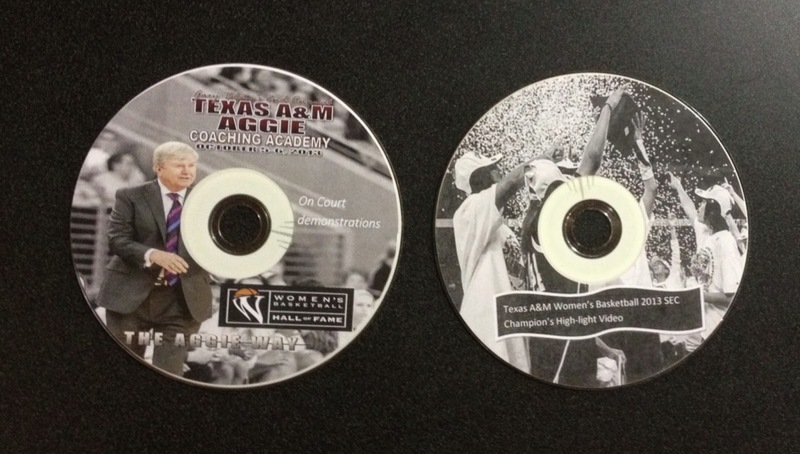 The first one will be a highlight of last season's Texas A&M Elite 8 run. The second DVD will be mailed a week after the Academy and will include all floor demonstrations during the clinic as well as a copy of any video presentations. So take good notes but know that you will have video back up in the mail coming! 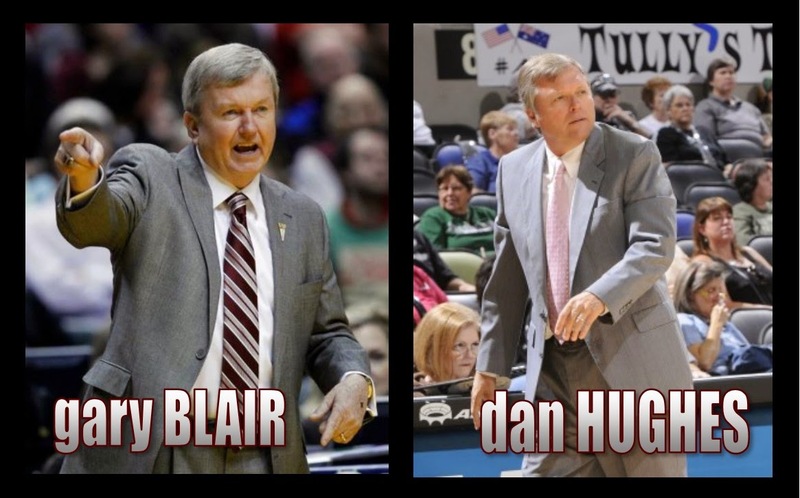 Besides great meals, an Academy Notebook and some great videos, you get to hear to of the best clinic speakers in the business -- Hall of Famer Gary Blair, and WNBA head coach Dan Hughes of the San Antonio Stars. Coach Blair hasn't slowed down after leading our Aggies to the National Championship and into the SEC where we have won the SEC Tournament Championship and then advanced to the Elite 8 the past two seasons. Coach Blair, a two-time national finalist for the Naismith Coach of the Year Award, has guided Texas A&M to nine straight NCAA Tournament appearances, and to four conference championships. 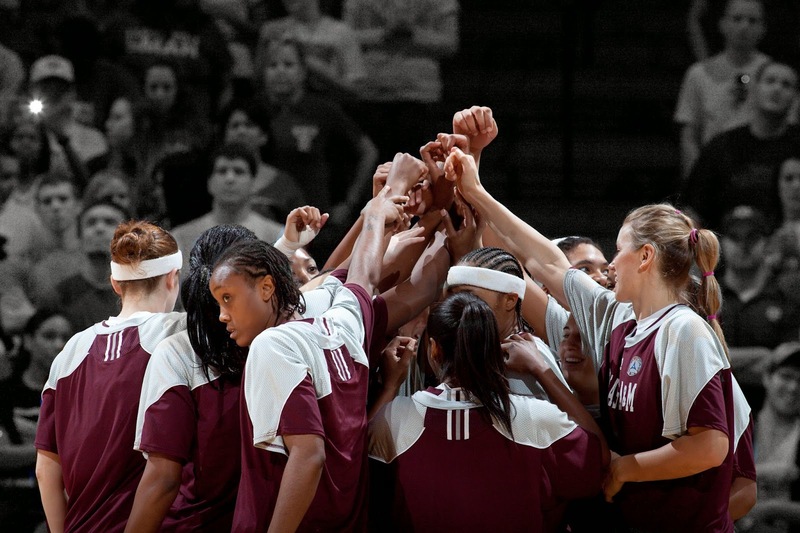 Blair led the Aggies to their first national title in their first-ever trip to the NCAA Women’s Final Four and closed out the 2010-11 season with a 33-5 record, the most victories in program history. The Aggies were voted as the No. 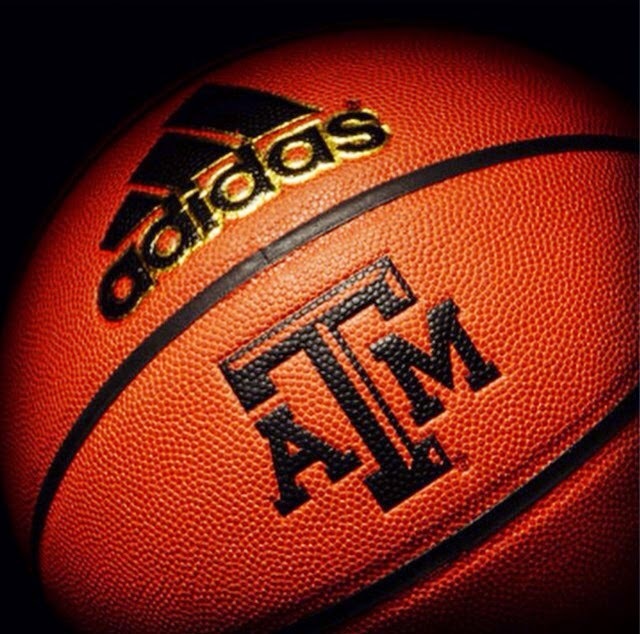 1 team in the coaches’ poll following the season, the first time Texas A&M stood atop either poll in women’s basketball. In 2013 he was inducted into the Women's Basketball Hall of Fame.